There, did that get your attention? If it didn't, I want to know the story of your life. Actually, I don't. Don't send me e-mails of your life stories, please. 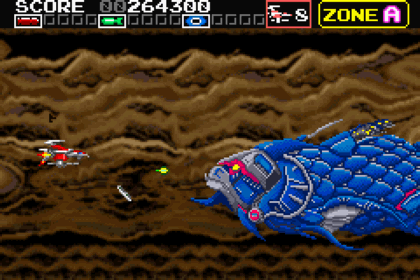 Anyway, I was curious about how many side scrolling, shoot-'em-ups (aka shmups) there were for the Game Boy Advance. Turns out, there really aren't that many. However, it was the first time classic shooter games like these were able to be recreated on a portable console, so you take what you can get. One of these classic gems is one that I hold very dear to my heart. I couldn't believe I was playing an arcade game that was so cool! The effects simply blew me away. That game was G Darius for the arcade. When I found out there was a Darius game that I could do for Game Boy Advance Month, you bet I snatched that sucker up! First thing's first. The effects definitely weren't as fantastic as the version I had previously played. Understandably, there's only so much a Game Boy Advance could do! But, you know, the graphics weren't that bad. The backgrounds weren't incredibly detailed, but I was more concerned with not constantly crashing into the foreground to notice the background much. One thing I did notice was that the background didn't really change for the boss fights. It was the same swirling "Starry Night"-looking ugly mess that was just recycled each time by changing it into a different color. These giant aquatic bosses need a new interior decorator...or would it be exterior? I'm really not sure exactly where you're transported to for the boss battles. The music is great for what it is. It really reminded me of the arcade version I had previously played. It has a great melody for constantly crashing into things and getting blown to bits! You might get a few of the songs in your head if you manage to make it to the second level. The sounds, however, sound a bit tinny and echo-y. Who actually cares about the sound in a shmup though? It's all *PEW PEW EXPLOSION* anyway! There be plenty o' fish in this thar sea! Darius ARRR, matey! If you couldn't tell already, this game is a bit hard to manage. 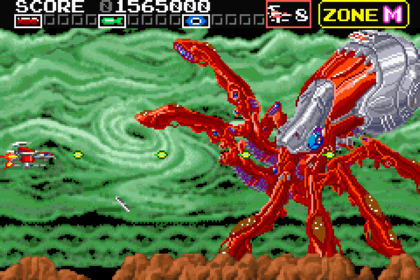 The first few times I played it, I couldn't even get past the first boss. Keep in mind, this was always on easy mode with the maximum allotment of lives! This is definitely a game you wouldn't be able to finish in one sitting unless you have superhuman reflexes. In order to get to the next levels, I had to input cheat codes. Now, I'm not one who's adamantly against cheat codes to get through a particularly difficult area in a game. I did try, though! I think it's ridiculous that a game can be so difficult that you can barely get to the second area. If you touch anything, you explode. If you get shot from a random laser from behind, you explode. If you fail to evade the boss's fire bullet hell, you explode. Even with the infinite lives cheat, I spent about eight lives each level, mostly on some of the end bosses' unavoidable attacks. You'd have to be a shmup superstar to play this game. I must warn you. If you use cheats, the game might bug out on you. I had invincibility on and defeated the first boss. I was ready to fly on to the next level...but I kind of just kept flying endlessly. I just wanted to enjoy the game! Overall, when I was able to get through the levels, the game is quite enjoyable. However, being forced to use cheat codes in order to get through the entire game is a major disappointment. I personally had high hopes. The game had almost everything it needed to be an awesome reproduction of an awesome arcade game for the Game Boy Advance, but unfortunately, it fell short due to its incredible amount of unbalanced difficulty. If you want to give it a shot, go for it! Just prepare to spend a lot of time memorizing where each laser shot goes.